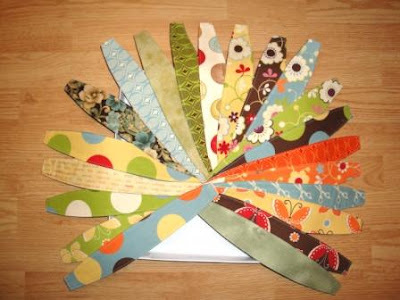 A while back I made some reversible fabric headbands for E. My sister liked them so much that she thought they would make great Christmas gifts and asked me to make 18 of them. That was months ago. Turning the buggers inside out tired my fingers so I procrastinated, but I found another tutorial online from The Long Thread that made making the headbands much easier. So here are the 21 that will soon tidy some little girls' hair in Utah. To finish them off, I need to get some 1/2 inch elastic from Joann. Very convenient that the chain is having a major sale this weekend. So the headbands will be finished in time for gift giving after all. 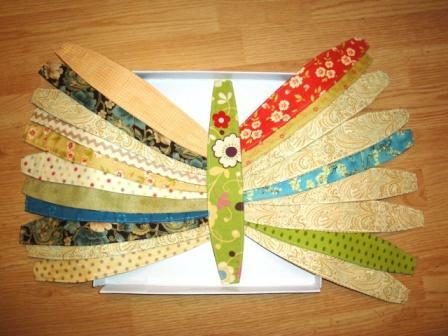 This project is a great way to use up scraps that are at least 13" x 2.5". And they don't take long to make either, especially if you make them assembly-line style. The tutorial in the Long Thread recommends that you fold each side of the headband and stitch wrong sides together so that you don't have to turn the headbands inside out. Well, the size of the headbands is large enough that turning them inside out is not that big of a deal with a sturdy safety pin. So I found it cleaner to sew the pieces right side together with a 1/4" seam and then turn inside out. Also helpful was hemming the short edges of each piece to create a clean opening where the elastic will go prior to sewing the pieces together. Doing so provided some stability for the safety pin and also meant not having to fiddle with the opening to get rid of the raw edges.